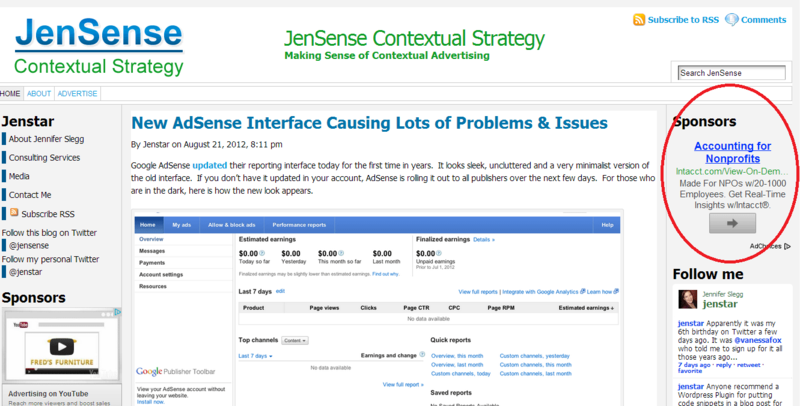 For many publishers, Google AdSense is a major source of revenue. But most don’t put a whole lot of thought into the details of this revenue source, taking a “set it and forget it” approach to display advertising. There are two primary ad types that fall under the display advertising umbrella: 1) image / rich media ads and 2) text ads. The difference is pretty obvious, but below are a couple screenshots of these two ad types in action. The best approach is to give Google the most flexibility to optimize your earnings for you; let it serve both text and image ads, and you’ll get the highest performing ads regardless of appearance. If you do include text ads in your display advertising efforts, you’ll want to spend some time experimenting with the color scheme you use. The default colors you set when you set up your account are just the beginning; you can (and should) experiment with countless settings for your ad appearance. Each site is different; often, a color scheme that blends your ad units into the rest of the site will deliver the best results. But in many cases a sharp contrast–for example, red links on a site with a green color scheme–will result in a big jump in the CTR and earnings. Again, experiment liberally here by including both combinations that you find visually appealing and others that offer more contrast while perhaps being less aesthetically pleasing. Simply changing color schemes is of course no guarantee to boost revenue, but if you experiment enough the odds are that you’ll come across a winning combination. How To Get There: AdSense Home >> Ad Units >> [Click on Ad Unit Name] >> Find “Ad style” Field >> Click “Use custom settings” >> Experiment! Google is always striving to serve ads on your site that are most likely to generate clicks and earn you (and them) revenue in the process. And it generally does a pretty good job of matching up ads with publisher websites. But there are ways for you to help out by narrowing down the types of ads that can appear on your site. As a rule of thumb, the greater the overlap between content (the original material on your site) and creative (the ads) the greater the CTR and the higher your earnings. So Google will generally serve ads for products and services that are at least tangentially related to the topic of your site. You can lend a hand in this process by telling Google to avoid certain types of ads that might be irrelevant (or undesirable for the image of your site). If you get into this, be sure to keep an eye on a couple of extremely helpful stats that AdSense provides. Comparing the % Ad Impressions and % Earnings fields tells you a lot about what’s working: if the former (% Ad Impressions) is much smaller than the latter (% Earnings), those types of ads are performing very well. Banning Specific Advertisers. By selecting “Advertiser URLs” you’ll have the option to make sure certain undesirable (or competitive) ads don’t show up on your site. Banning “Sensitive” Categories. Be sure to check out the “Sensitive categories” option; this dashboard lets you approve or disable certain types of ads with which many publishers may be uncomfortable (for example, “get rich quick” ads or pharmaceutical ads). The tips above are just the tip of the iceberg; there’s plenty more that you can do to optimize your AdSense configuration and boost your earnings. But these tweaks are a good place to start; they’re all very easy to implement and the impact on your earnings can be substantial. The best advice we can give is to be creative, and embrace the experiment. You should be constantly changing and experimenting with your AdSense design and layout. Not every experiment will be a win, but if you stay at it you will come up with combinations that lead to higher earnings. Nice work…Valuble information for bloggers/beginners.thank you! Now i have doubled my income on Adsense. thanks for the detail information !! It’s also important to try testing your ad positions! 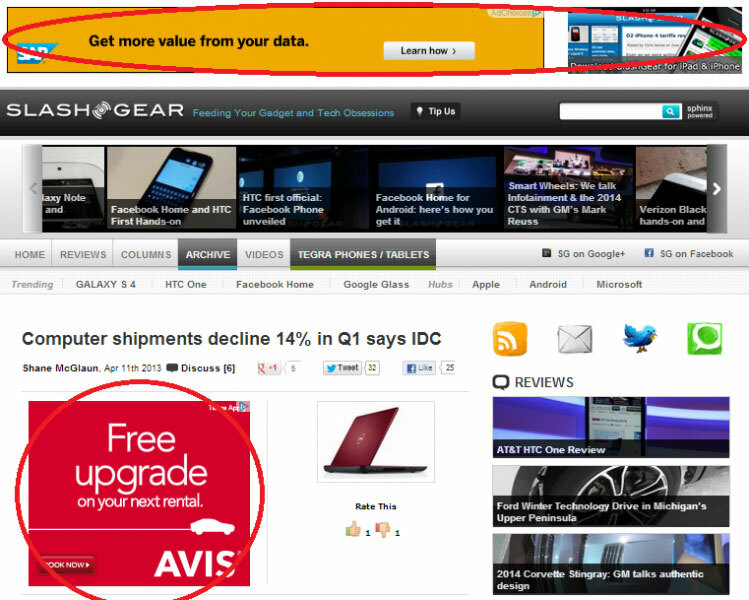 On a typical WordPress blog the best performing ads I’ve realized come above, within, or below the content. It’s also important to try testing your ad positions! On a typical WordPress blog the best performing ads I’ve realized come above, within, or below the content. Stay away from placing ads in your header/sidebar/footer!